This article is written to mark Sri Lanka’s “National Occupational Safety & Health Week”, which falls in the 2nd week of October. “My eyesight seems to be deteriorating. When my father was alive, he could see very well until the day he died. But I have a problem with my sight and it could be because of the strength of the chemicals I use. I do not use face masks and gloves every time I handle chemicals” says Wimalasena, a 57 year old paddy farmer from Kekirawe. 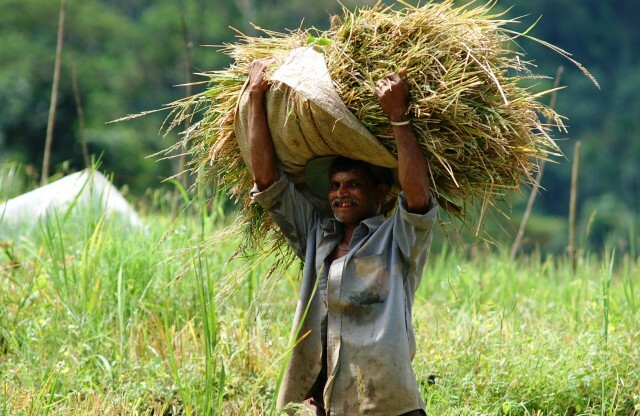 In Sri Lanka, of the total informal employment, the highest (87%) is in the agriculture sector. A majority of agricultural workers are paddy farmers; with around 1.8 million farm families engaged in paddy cultivation island-wide, producing 2.7 million tons of rice annually. While ensuring the health of workers is important in enhancing productivity, economic development and social welfare, Sri Lanka’s informal sector is not covered by the Occupational Safety and Health (OSH) legislation. Statistical and other information related to OSH is limited and under reported as there is no formal reporting system to capture such data. Only 1% of work-related accidents are reported in Sri Lanka in contrast to countries such as Australia (89%), New Zealand (88%) and Malaysia (79%). The major occupational health hazards paddy farmers are exposed to include body aches and pains, exposure to hazardous chemicals and chemical poisoning, kidney disease, leptospirosis (commonly known as rat fever), accidents encountered when using machines, elephant attacks, snakebites, exposure to high temperature, and mental stress. Chemical poisoning is often cited as a major occupational health risk; with problems in eye-sight, skin and breathing seen as health issues relating to unsafe chemical use. Another major health concern paddy farmers’ face is the Chronic Kidney Disease (CKD), which is mostly reported from the country’s North Central Province. The World Health Organization (WHO) has estimated that more than 15% of the population aged 15 – 70 years in the North Central and Uva Provinces are affected with CKD. Since CKD was first identified in 1991, there have been reports of over 22,000 deaths in the Anuradhapura district. Although the exact root cause for the disease is still unknown, farmers are highly vulnerable to CKD given their lifestyle and occupation conditions (continuous and excessive exposure to hazardous chemicals, dry zone climate and long work hours). Leptospirosis is another occupational hazard faced by farmers and it is reported that it has severe after effects such as joint pain and exhaustion. “I was diagnosed with rat fever 6 years ago. I was at the Kekirawe hospital for two weeks and then transferred to the Peradeniya Hospital. I didn’t receive any financial support during my stay at the hospital. I was not aware of rat fever at the time. After I recovered, I found it difficult to work long hours, and I easily feel exhausted. Now I take a preventive medicine for rat fever before I go to the paddy field”, claims Siriwardene, a 48 year old tenant paddy farmer from Kekirawe. Paddy farmers are also very vulnerable to mental health risks mainly due to worries from lost harvests, fluctuating market prices, and seasonality of their income. They constantly worry about their cultivation, and continuously struggle to protect their fields from wild animals. They try their best to face adverse environmental conditions such as floods and droughts. All these worries related to their occupation and have an effect on their mental health. Poor working and living conditions, high exposure for occupational accidents, fatalities and disease, lack of occupational health services to cater, non-availability of comprehensive legislation on OSH for the agriculture sector, and the lack of related knowledge among farmers are major OSH issues faced by the agriculture sector of the country. Prevalence and operation of risk preventive mechanisms, emergency response plans, and precautionary measures for major occupational health risks are minimal among paddy farmers. In general, farmers know about their work related health risks. But sadly, they do not always follow risk preventive measures. For example, farmers know the health risks of handling hazardous chemicals, but they do not always adhere to protective measures mainly because of the discomfort (wearing masks/gloves make it difficult to handle spraying machines and wearing boots make it difficult to walk through muddy paddy fields) and sometimes due to carelessness. Establishing a well-organized and structured data collection system is one of the initial steps of addressing the issues of OSH of the country. Covering the informal sector would be more difficult than the formal sector. Yet mechanisms should be designed in such a way that OSH of paddy farmers/ informal sector workers are ensured. Strengthening the existing health awareness programmes with a special focus on occupational safety and health is another important step that can be taken. New ways to overcome the problem of uneasiness of using precautionary measures when applying chemicals should be explored. Harsh chemicals should either be limited and/or banned from the market, as major occupational health risks faced by paddy farmers are linked with the usage of hazardous chemicals. The problems that Wimalasena and Sirawardena face are common among many farmers across the country. Safeguarding the health of the millions of paddy farmers in the country is crucial given their contribution to the economy and their role in our social structure. This article is based on a research study by IPS titled “Health Inequalities, Work, and Access to Social Security of Informal Workers in Africa and Asia”. The study was led by FLASCO-CHILE with the funding of Rockefeller Foundation.